Searching for treasure on the beach is one of life’s pleasures. On sunny days you soak up the rays and on cold, windy days you appreciate the majesty of those crashing waves – not to mention the fresh air is great for your health. However, all that glitters is not gold and you’ll find a whole array of rubbish there as well from drink cans to old car parts – it’s amazing what the sea can throw up. If you fancy a go at beach metal detecting welcome to the club – here are tips to help you find treasure on the beach! 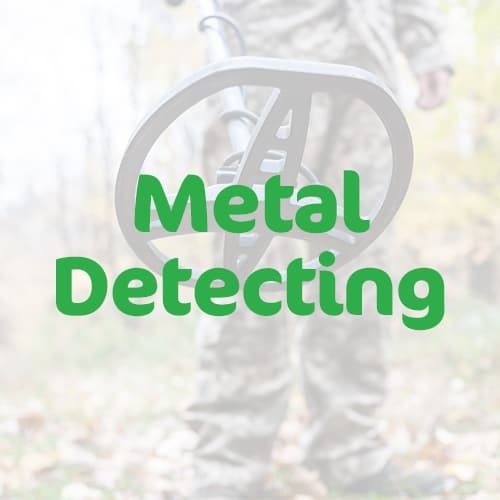 Quick Tip: If you’re new to metal detecting, and not sure which model to go for, check out my guide to the best rated metal detectors here! Before you start swinging that coil across the sand, check your preferred beach doesn’t require a permit. Public beaches may require permission from the local government and you’ll need to approach the owner of a private beach. If you’re sticking to dry, sandy areas then your regular detector will work just fine, but if you fancy delving into the wet sand or even the surf you may need a different machine. This is because wet sand is often mixed with ‘black sand’, and black sand is mixed with iron and other minerals that can trick your detector into springing a signal. Salt from the ocean water and surf spray can also cause problems with components. 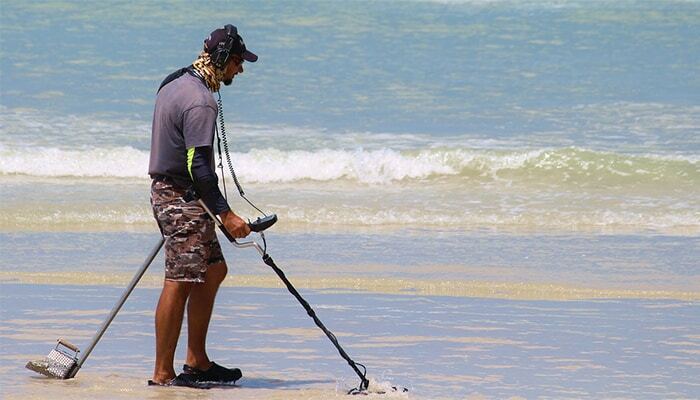 Beach metal detecting is so productive it won’t be long before you’re hooked. Pop a beach metal detector on your birthday list if you enjoy the surroundings. Research always pays off so learn how to find metal at the beach by studying the tides. Beaches are ever-changing beasts. They don’t placidly sit there but alter with the tides, seasons and weather patterns. Learn about these and you’ll find much more. Tides are created by the gravitational pull of our moon. There are two high tides and two low tides a day. High tide is when the sea covers the sand and makes the beach area small. Low tide is when it pulls back to uncover the whole beach. During high tide wave action shifts sand around, churning up potential finds, and then draws back. It’s an open invitation to investigate and it would rude not to look, but please, please be aware of when that tide is coming back in, especially if you’re on a secluded beach. Too many people have lost their lives to incoming tides. Obviously, metal detecting at low tide is the time to look! Get there early because lots of folks enjoy beachcombing. The area to concentrate on soon after low tide is the visible wet sand. Look for troughs and dips – more on that later. As well as ever-moving tides the sea tends to gravitate toward one end of the beach. On pebble-filled beaches you’ll find one end of the shore has large stones whereas the other has finer sands. Concentrate on the finer end because this is the direction that the sea has moved towards, taking its precious treasure with it. Jetties are a good place to search as objects get caught up in their gradual sweep down the beach. Seasons matter because it affects how people use the beach. In summer it pays to check the watery areas as beach-goers are more likely to take a dip in the sea than in winter months. Scour the area between lifeguarding posts and look for signs of sports like volleyball or sailing. Where there were people, there is treasure. In winter it pays to search the dry sands particularly bonfire or picnic remains, dunes and areas providing shelter from the elements. But this all changes after a storm because high winds and crashing waves wash up and uncover metal that’s been buried for who knows how many years. 6. Don’t Let Stormy Weather Stop You! Just like fossil hunting if there’s been a storm get thee to the coast and search out treasure. The smashed tide line is a great place to begin searching after a storm, but be careful. Don’t go near the sea during bad weather. Seas are unpredictable and it’s not worth the risk. You won’t be the only one there after a storm. 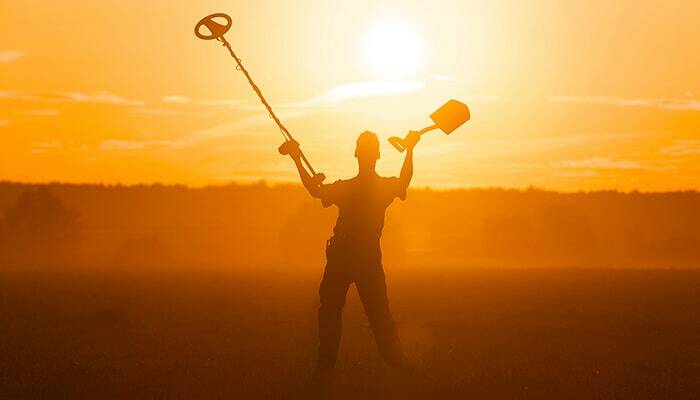 Experienced metal detectorists know its prime hunting season because the sand will have moved more than usual. Keep your eyes peeled for storm cuts. These are areas that the storm has damaged, such as dunes or areas of the beach. A storm can peel back layers of sand, allowing a glimpse of what’s usually hidden and a greater depth to search in. Get there quick – it’s likely to refill fast. The towel line is famous among beach metal detectors. Its’ self-explanatory but I’ll go ahead. The towel line refers to where beachgoers tend to place their towels. It’s above the high tide mark – usually a line of seaweed or other bits the sea has temporarily left behind. Sun-hungry folks dump their belongings here, apply sunscreen which makes their fingers slippery, and rifle through their bags. Objects fall off and out with alarming frequency. You’ll find sunglasses, phones, coins and jewellery along the towel line, along with Coke cans, beer cans and tin foil depending on the quality of your detector. Whilst the empty stretch of beach is tempting, it isn’t likely to yield much and should be the last place you look over. Troughs are dipped areas of sand close to the water line or just before a sandbar. A long trough is often visible parallel to the shoreline. Troughs are great places to search and one of the first places experienced detectorists look for after the towel line. Finding one is key to finding treasures. Items often settle in these temporary troughs as the sea retracts to low tide. The water in them doesn’t move as fast as the waves and allows objects to sink there especially for you to find. ‘Pocket’ is the term describing an area where larger numbers of objects are found – it’s a natural box of gifts that may be in a trough or a dip. 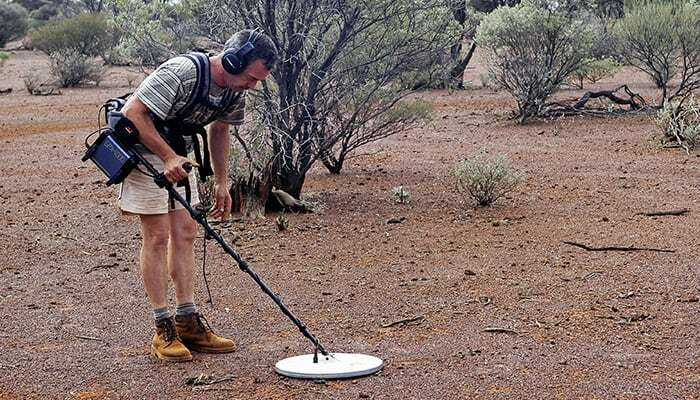 Go extra slowly with your metal detector and if you find something keep on looking close by. When you find a trough or a pocket take your time because it might not be there tomorrow. Beaches constantly change – but that’s what makes them so exciting for metal detecting. OMG – a target! But wait, because digging sand is different to digging soil, unfortunately, its much more frustrating. On soft sand you may find digging an almost impossible task. Fine dry sand simply slips back into the hole, re-filling it until your head is fit to burst with frustration. Damp sand is easier, but the hole will fill with water. Go slowly and scan the pile of discarded damp sand frequently to check you haven’t already pulled your priceless gold ring free. If you’re digging in the surf, you’ve got to be quick and watch for the waves pulling your target back out to sea. Go armed with a decent spade, trowel or specialist beach scoop to help the digging. Sandy beaches that have outcrops of stones or pebbles are mini gold mines. If you find one near a sunbathing area you’ll be calling bingo. Rocky outcrops are great little hotspots because stones trap rings, coins, and other metals preventing them from washing away. Keep your eyes peeled for pebbled areas and take your time scanning them. Rocky areas may change with every tide bringing new finds with them. Most of us delved into rock pools as children but we were searching for crabs then. Now we’re looking for gold! Never let a rock pool pass by if you’re metal detecting on the beach. They are natural holes that trap tidal action on a twice-daily basis – and this means they potentially refill with new treasures twice a day. There’s also the possibility that someone has been reaching in to crab hunt and something has slipped from their person. If you find rock pools near the sandy tourist areas pay extra attention to the beep. Just a word of warning here, seaweed makes rock pools very slippery and dangerous. Be careful, and wear sturdy shoes. 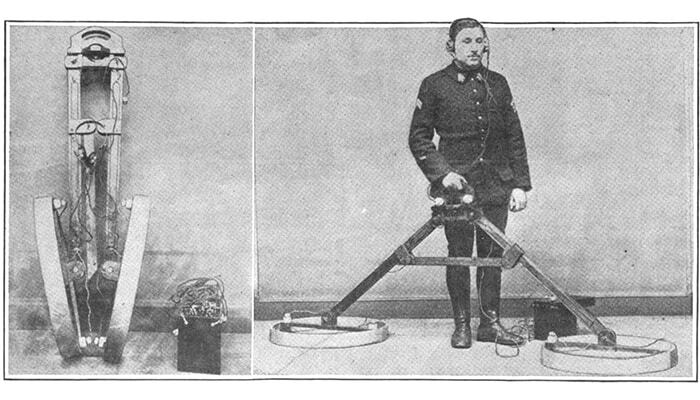 If you’re getting serious about beach metal detecting check if there’s a metal-detectors forum posting about finds on your local beach. Its great camaraderie and they may also have localised tips on hot spots and tidal action. It’s always encouraging to see what others have found. Next time, it could be you. Children universally love a treasure hunt. They can barely contain their excitement at first but eventually get bored if finds are thin on the ground. If you’re taking children metal detecting on the beach, always scan areas around food outlets for dropped cash. Finding a coin can make a child’s day. If you don’t find anything be prepared to hide a coin or two. You may think this is cheating but it’s disheartening for the youngsters to find nothing but Coke cans. Hiding coins in the sand so they can dig them up helps foster a love of metal detecting – and prevents bored tantrums. 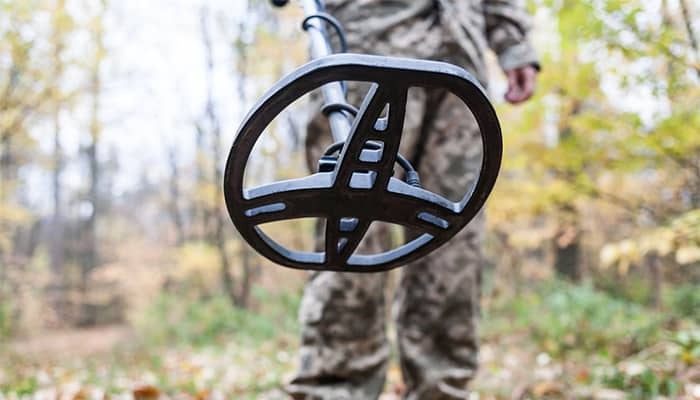 Be sure to check out my guide to the best kids metal detector. If you find a piece of jewellery consider trying to track down its owner. Jewellery can have sentimental value and the owner might love to have it back. We all make mistakes, losing your wedding ring can be very upsetting for example. Do the right thing. If the owner can’t be traced then at least you tried. Every time you head out to the sands you’re given brand new conditions to search in. How exciting is that? Tides, weather, tourists and constant ocean motion keeps it fresh. You’ve more chance of finding metal on the beach than anywhere else. But we all have bad days, and if you don’t find any metal you could always collect other beach treasures such as driftwood, shells and sea-glass for example, and while you’re there consider clearing away some rubbish. Our beaches are turning into trash cans and killing wildlife. Some beaches even have a bucket-filling scheme to encourage clean-up. In return for a full bucket of rubbish they’ll give you a free coffee. Take part in this if you can because we don’t want to let David Attenborough down do we? And free coffee is always good, especially if it’s a windy, chilly day. So there we have some top tips to get you started metal detecting on the beach. If you’ve never tried it, guaranteed you’ll be hooked. We do love to be beside the seaside, and if you find some gold treasure too what could be better?